This is a good way to ensure that the audience sees the theatre and are reminded of the fact they are watching a play. Often in Brechtian theatre the style of the music and the lyrics jar, they don’t seem to fit together in style. This distances the audience further. It’s worth listening to the song ‘Mack the Knife’ from The Threepenny Opera by Brecht and Kurt Weil. Notice how the musical arrangement and melody are upbeat and joyous, yet the lyrics are sinister and dark. This is a very Brechtian approach. One of the most famous lines from this work would still appeal to a modern audience: Who is the bigger criminal: he who robs a bank or he who founds one? Kneehigh Theatre’s production, The Red Shoes, employed several Brechtian techniques, such as song and dance, a narrator figure, placards and multi-role casting. It's no accident that montage is a term that we’d more readily associate with cinema. Brecht consciously borrowed the idea from silent movies. A montage is a series of short self-contained scenes grouped immediately after each other whose juxtaposition or contrast highlights the important issues with absolute clarity. This idea of separate scenes also allows for a focus on minute details if the situation of the play demands it. 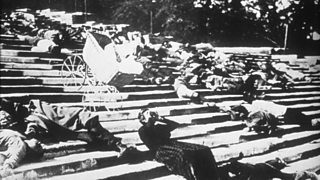 Brecht was influenced by the film director Sergei Eisenstein's greatest demonstration of the power of montage in the ‘Odessa Steps’ sequence of his 1925 film, Battleship Potemkin. In the famous sequence involving a runaway baby carriage, Eisenstein uses montage to arouse emotion and create suspense.